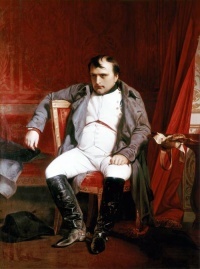 Napoléon Bonaparte abdicated in Fontainebleau  (1845) is a painting by Paul Delaroche of Napoleon. It is in the collection of the Museum der bildenden Künste. Delaroche seems to have taken his inspiration for the pose from two contemporary engravings, one, a lithograph Burdet, after Raffet, Napoléon 1812, illustrated in Anquetil and Burette's l'Histoire de France (Paris, 1838), and the other, a vignette on wood by Loutrel, after Horace Vernet, Première abdication de Napoléon Ier à Fontainebleau, illustrated in Laurent de l'Ardèche's l'Histoire de l'Empereur Napoléon (Paris, 1839). Unless indicated otherwise, the text in this article is either based on Wikipedia article "Napoléon Bonaparte abdicated in Fontainebleau" or another language Wikipedia page thereof used under the terms of the GNU Free Documentation License; or on original research by Jahsonic and friends. See Art and Popular Culture's copyright notice. This page was last modified 10:25, 25 September 2013.